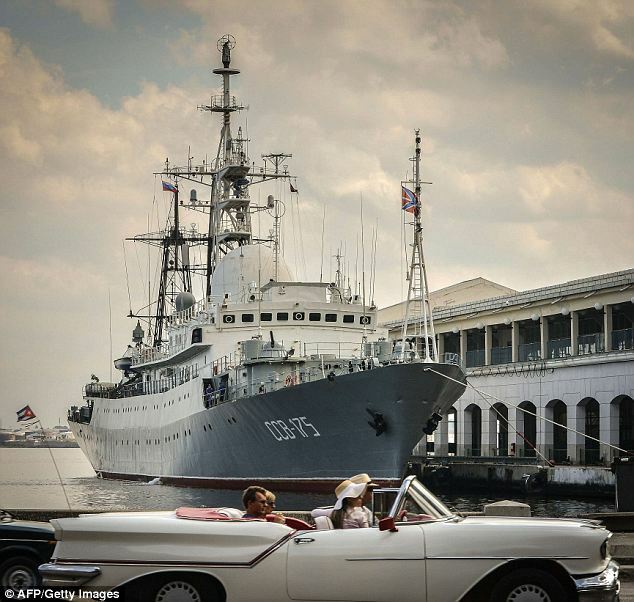 A Russian spy ship docked in Havana on Wednesday, and neither Cuba nor Russia offered any mention or explanation of the mysterious visit that is reminiscent of the Cold War. AFP reported that the Viktor Leonov CCB-175 boat, that measures 300 feet long and 47.5 feet wide, appeared in the section of Havana's port usually used by cruise ships. The intelligence vessel bristles with electronic eavesdropping equipment and weaponry, including AK-630 rapid-fire cannons and surface-to-air missiles. Cuba's visitor is from the Vishnya or Meridian-class, which was built for Russia's navy in the 1980s and is still in service today. AFP reports that the Viktor Leonov has a crew of about 200 sailors. Previous visits by Russian military ships to Cuba have usually been acknowledged by the state's media or authorities. Meanwhile, the United States warned Moscow over Russia's maneuvers near the troubled Ukraine. Vladimir Putin's announcement of huge new war games came as Ukraine's protest leaders named a millionaire former banker to head a new government after the pro-Russian president went into hiding. The new government, which is expected to be formally approved by parliament Thursday, will face the hugely complicated task of restoring stability in a country that is not only deeply divided politically but on the verge of financial collapse.